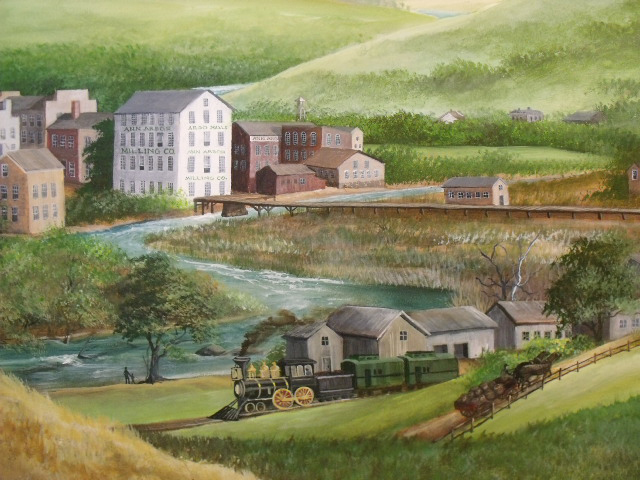 Meetings at our office are surrounded by the green hills of high summer under a pale evening sky, with farmers bringing in their hay, horse-drawn carriages heading to town, and the Huron River coursing by in the distance. 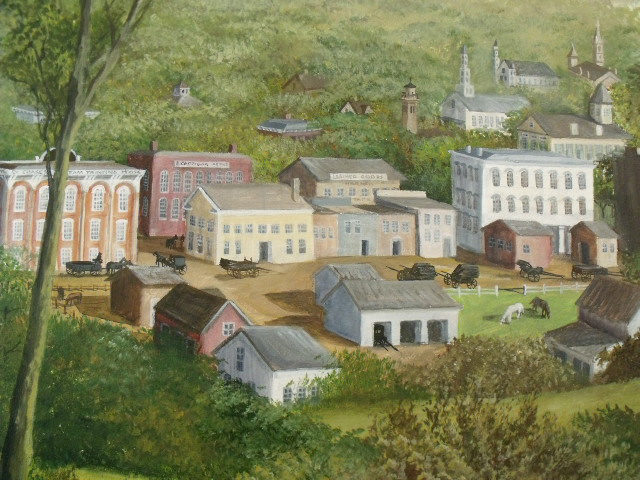 This is 1860s Ann Arbor as depicted in a mural on the four walls of our conference room. A product of many years of imagineering, this mural is mostly history, part allegory, and part homage. 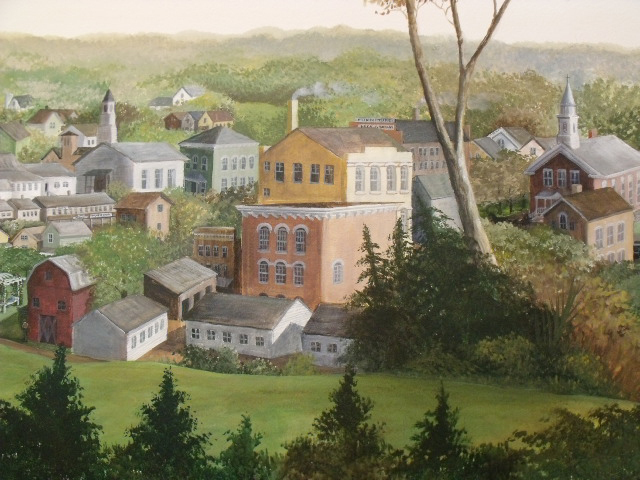 History is preserved in the accurate rendering of buildings of the period. 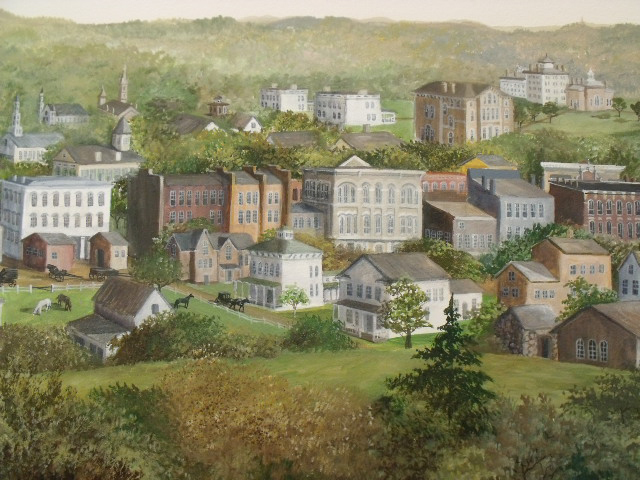 Upper Town, what we now call downtown, appears on the west wall as viewed from the Spring Street hill. 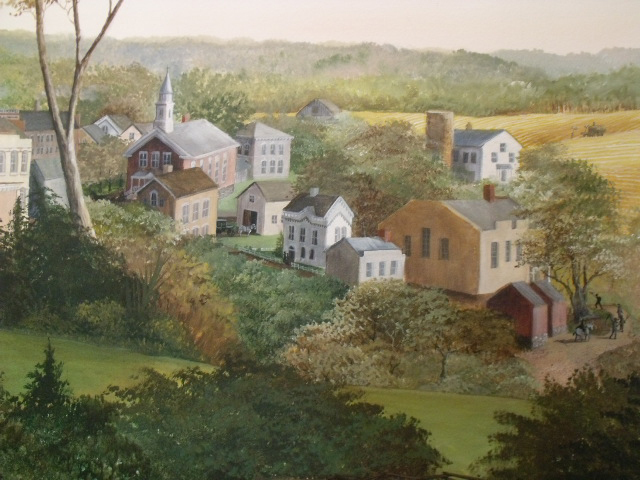 We see the homes of famous early residents, the fire house, the courthouse (of course), and several churches that still stand today on State Street. In the distance is the University of Michigan, which had, by 1860, been in town just 23 years. 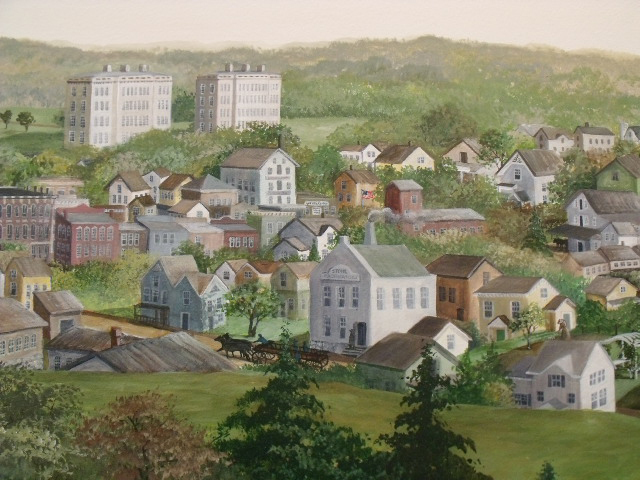 The south wall displays Lower Town along the river, which was the first settled area of Ann Arbor, as it would have appeared from what is now the U of M hospital hill. 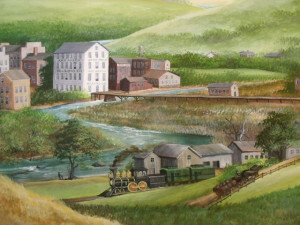 The Ann Arbor Mill, Michigan Central Train Station, and Agricultural Works building are surrounded by farm fields. 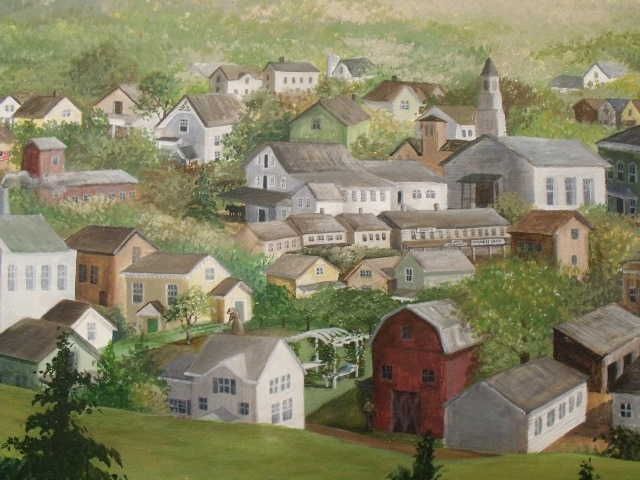 Each wall offers an allegory about how our town got its name, which is unduplicated among the place names of the world. John and Ann Allen, from Virginia, and Elisha and Ann Rumsey, from New York, settled in the Michigan forest at Allen’s Creek in February 1824. 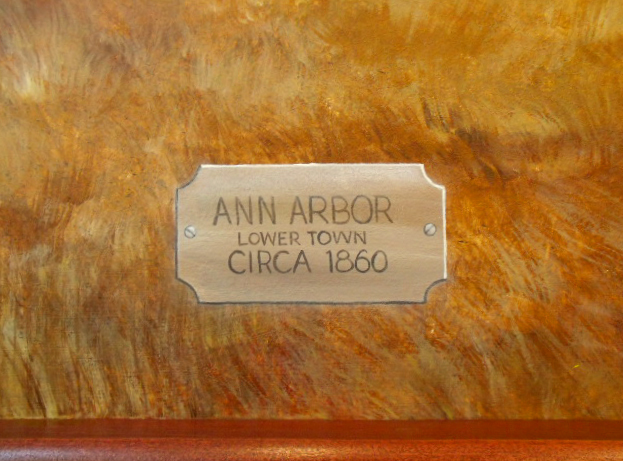 On May 25th of that same year, the Plat for “Annarbour” was recorded in Detroit. Legend has it John and Elisha built an arbor and trained upon it wild grape vines and roses. They named their settlement as a compliment to their wives, who enjoyed the arbor on warm spring days when hope and promise were renewed. 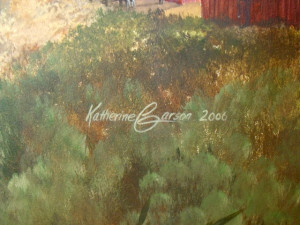 The fabled arbor appears in the mural among the houses in Upper Town, near the current site of the YMCA. 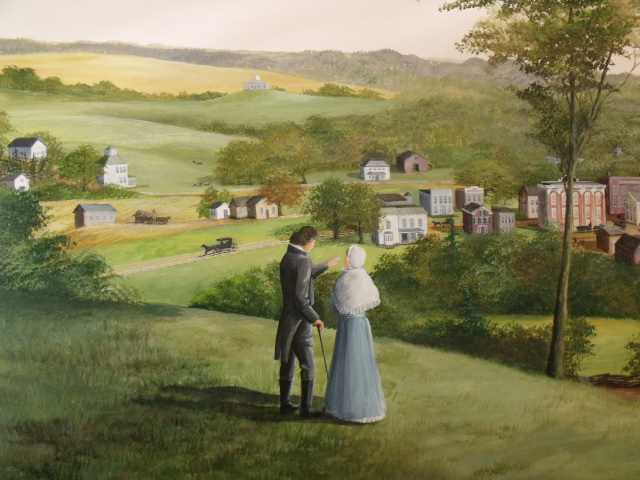 Ann and John Allen also appear, overlooking their town, but this part is surely allegory, because he was no longer alive in 1860. 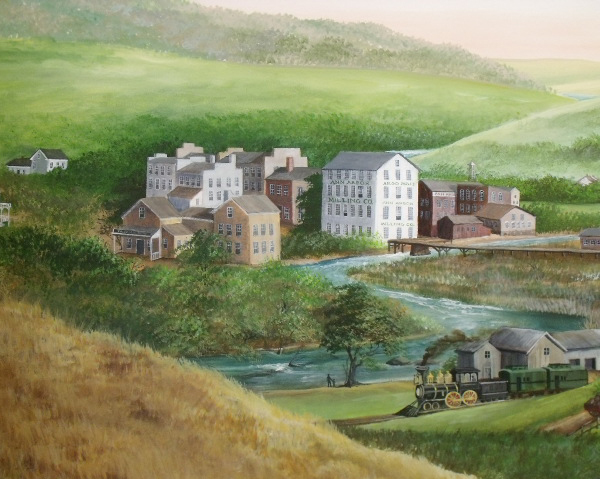 The south wall’s allegory is inspired by a story from David Hackett, one of the earliest pioneers who returned to town in 1900 after an absence of nearly 70 years. He described a beautiful young woman, frail with heavy black hair and blue eyes, who had guided people through the wilderness hereabouts long before the arrival of the Allens and Rumseys. As early as 1813, there were stories of a female wilderness guide, named Ann, who lived on a hillside above the Huron River. When a group of settlers came to ask her to join their village across the river, Ann led them to a grave near her home and exclaimed, “Here lies all that is most dear to Ann d’Arbeur, and here shall she stay while life lasts.” The pioneers paid tribute to her memory by giving her name to their settlement and even inscribing it on a rock in the middle of the river. By the time Hackett returned to town, he was sure he found that very rock, but 70 years of water and weather had expunged the name from all but the town. 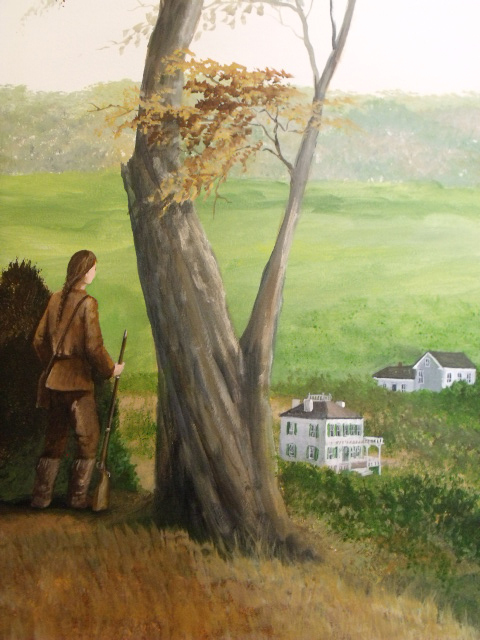 A young Ann of the Woods appears in our mural, overlooking Lower Town, though she was surely not present in 1860, except in spirit. This mural was inspired by the landscapes of North America on the wall of the Diplomatic Reception Room in the West Wing of the White House. 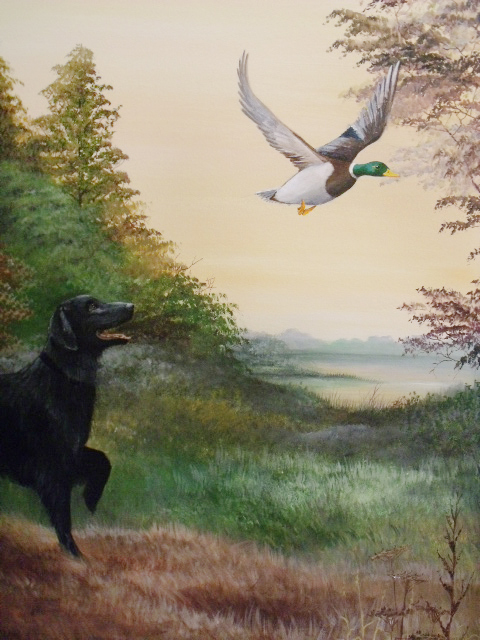 Our local landscape is made even more personal by the homage it pays to our first Flat-Coated Retriever, Spot, who is shown happily flushing a mallard. 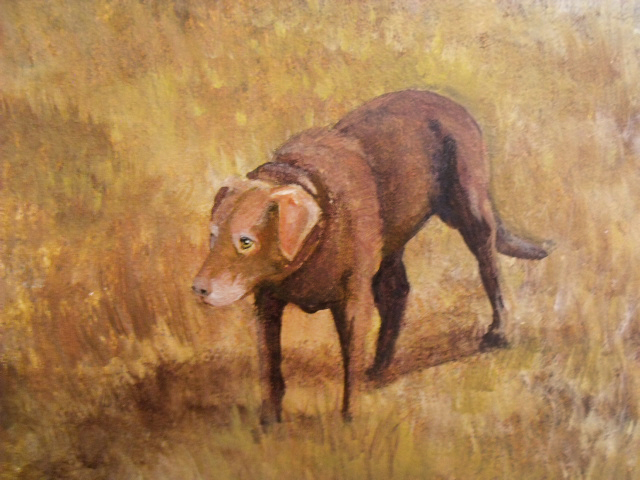 As any dog lover will attest, because of who she was and because of her first-ness, she changed our lives in so many wonderful ways. And, yes, we are the kind of folks who would have an all black dog and still name her Spot. Dogs (including our own retrievers Rosie, Blanche and Ruby) are always welcome at our offices. 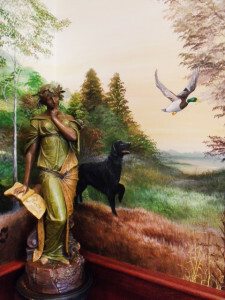 In fact, as Katherine Larson, internationally renowned mural artist and classical soprano, painted the mural, she was ably assisted by her Weimaraner, Jacque, who also signed the mural, as he too is one of its creators. Click a photo below to open the Photo Gallery.